Kurt Godiksen ’73 was one of the contributing artists participating in the inaugural Alumni Art Exhibit celebrating Westminster’s 125th anniversary. His unique portrait of school founder, William Lee Cushing, which he gifted to the school, now hangs in the permanent collection in Baxter Gallery located in the Armour Academic Center. His Cushing portrait also appears on the cover of the 2013-2014 Westminster calendar, and his pen and ink drawing “Rosedale Tractor”, is the calendar’s featured-artwork for the month of June 2014. Kurt’s unique portrait style commemorates each subject’s life by creating an image constructed from that person’s particular life history. Detailed Imagery is meticulously composed to form the likeness of the subject. In celebration of Westminster’s 125th year, limited-edition fine art prints of the “William Lee Cushing” portrait are now being offered to the Westminster community. Each 16” x 20” print is numbered and signed by the artist. These high quality pieces are printed on 100% cotton, acid-free, archival matte paper with archival ink. Only 125 limited-edition prints are being offered through the school for $125 each. To acquire a print, please contact Kurt. 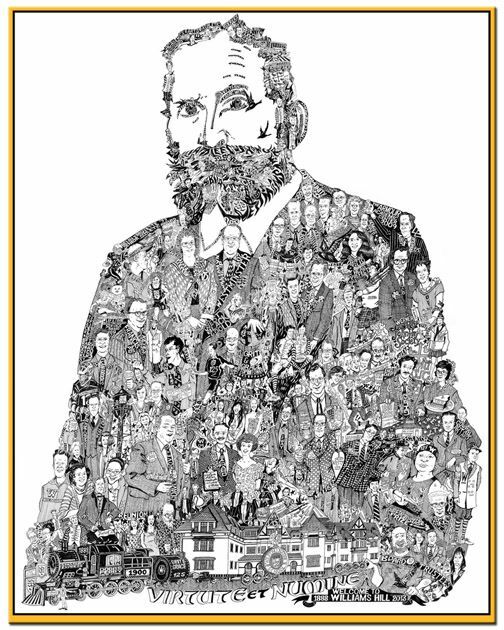 You can commission an original Kurt Godiksen commemorative portrait illustration of a family member, friend or associate by contacting him directly.